The main living space with wood floors and a fireplace also features walls of windows overlooking the lake and property. There are sliding doors to a wrap around deck to enjoy the outside space . The kitchen with counter area is open to the main living space and also has doors to the deck. A first floor bedroom and bath make this easy living on the main level. 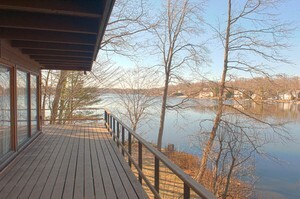 The lower level has 3 additional bedrooms all with walls of windows that overlook Pines Lake and grounds. This is an great location for a renovation in a wonderful setting with fabulous lake living including sailing, swimming, tennis and other activities. For More Photos and info: Click Lynn Brescia, Realtor.